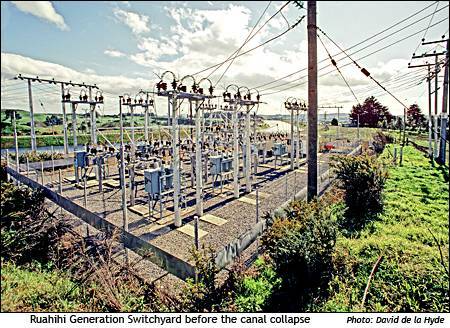 33kV circuit breakers are mounted in the switchyard. 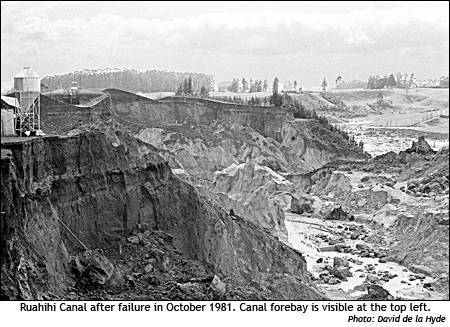 In the background can be seen the canal - this section was later bypassed by installing low pressure concrete penstocks. 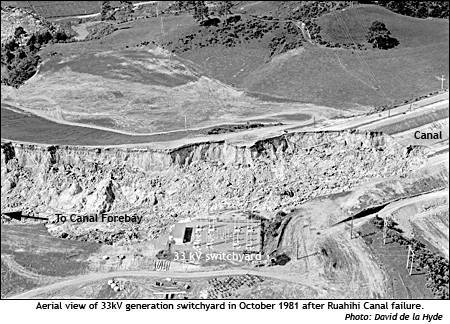 I hired a small topdressing plane for a nominal cost and took photos of the Ruahihi canal and powerhouse both before failure and about a month afterwards. The pilot, whose name I have forgotten, was highly cooperative! From the ground the view was not visually interesting enough for me. 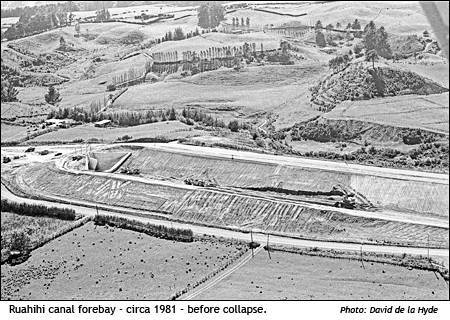 "The original scheme had a 2000m canal laid along a side slope, leading to 750m of concrete and steel penstocks. 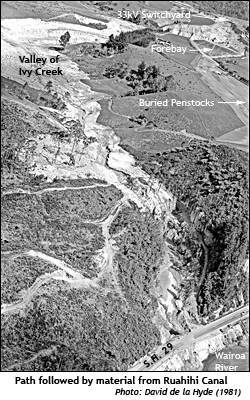 The canal was excavated in soft ignimbrite (debris from a volcanic explosion) and lined with a type of volcanic clay. The brown ash dried and cracked during construction but due to its unusual characteristics, the cracks did not seal when the canal was filled. So water leaked into the ignimbrite below. When these leaks appeared perforated pipes were driven in to drain the bottom of the slope. This hid the problem and also made it worse because the leaking water caused caverns to form in the fill." 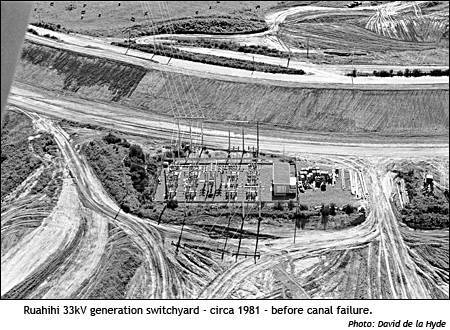 In the canal forebay photo above, heavy earth moving equipment can just be seen within the canal. It appears that material is being placed to fix the canal lining in position (the long black streak).